Good fun for its target age range. 11-year-old twins Nick and Tesla (ha ha) are staying with their distracted inventor uncle Newt (ha) when they discover that something nefarious is going on. Their house is under surveillance, their belongings start to disappear, and a bunch of suspicious people show up. But which one is the spy? Or thief? Or both? Nick and Tesla build several spy gadgets (and show you how to build them too) to help solve the mystery. The gadgets are fun, although some don't look like they would work exactly as planned, and their use in the plot in some cases is strained at best (e.g., why build a booby trap to drop water balloons on someone if you're standing right there with other water balloons you can throw with your hand?). Still, the inclusion of gadgets with instructions elevates this book for me from 3 stars to 4 stars. I enjoyed the first half of the book (setup) more than the second half (revelation). The plot devolves into an increasingly unlikely denouement with characters that are increasingly implausible (and was anyone else annoyed by Oli's cringe-worthy foreign dialect? If it turned out to be so bad because Oli was faking it, that would have worked, but apparently not.). But in the end, who doesn't enjoy seeing smart kids solve a mystery and come out on top? 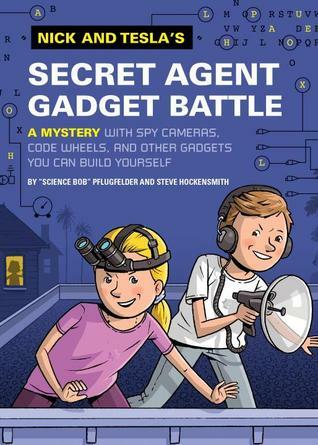 Sign into Goodreads to see if any of your friends have read Nick and Tesla's Secret Agent Gadget Battle.